Everyone know about how powerful the video is for marketing online and there is no need of discussing its importance as it is an open secret. Businesses and individuals have already started incorporation of video in their marketing strategy but only a few of them were got successful in winning the audience hearts with effective videos. This is because the lack of perfect strategy and backlogs in the implementation of such strategic plan. Let us know how to implement perfect video marketing strategies to become successful online. 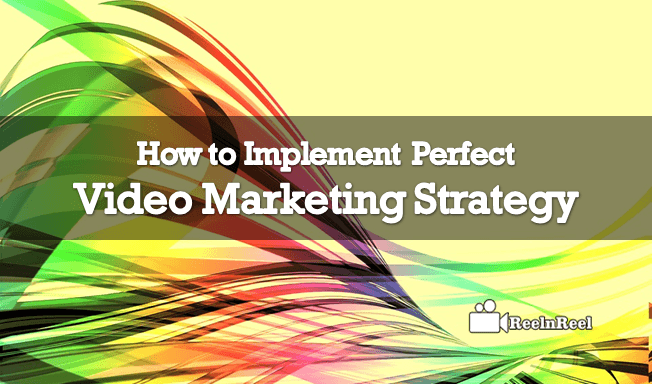 Follow this step by step guide for video marketing strategic implementation. This is the first step that every marketer go with while starting their own video marketing strategic implementation. Videos marketing strategy need several elements in consideration for efficient strategic planning. You must brainstorm various things about how you outline the video and how to measure the success of your video content and the objectives of your independent channel or business. Everything must be calculated in brief before and while drawing your videos road map. Know about your own roadmap and the routes you have planned to reach the targeted audience and how to accomplish the things in a right way. Which type of video content do you want to go with? And what type of topics you want to choose in order to convey your message to the audience. The content type is also had its own impact on your audience. so, choose your content type wisely by knowing the perspective of marketing content. Don’t just think like a marketer or promoter of your videos. Always be in the audience while you are looking in audience perspective just like what you can have by watching this particular video. So that you can fetch the right things that can work better to reach your goals. As a marketer, you have to map these as your priorities and target the audience basing on their interests and what they are expecting from your videos or from your niche. Decide which type of production you are going to choose for the production of your video. You can hire an in-house videographer or you can outsource the production. The main thing you have to focus is on script writers and the creative heads working in your company. So, your editorial board members are the key stake holders in your video success. Choose where you want to make your videos live. You can choose different platforms to make your content live. You must need a definite planning for hosting your video content across the web by choosing the perfect place. Before the implementation of your plan, your plan must also include the metrics and performance tracking of your overall strategy. So, brainstorm the ways of measuring your plan once it was implemented, because you must know how your plan was implemented and how well it is working. So, finally, you have created the best plan for your video marketing strategy and now its time for perfect implementation of your strategy to go forward. Search for the right platforms and places to implement your video marketing strategy. The strategic planning will not be changed with the place; the only change will be the format and way of promoting the same on different platforms with slight changes in approaching the people on social platforms. Know about various social media platforms and the different types of campaign and related tools for marketers. Know about how you can utilize them all to reach your ultimate goal after implementation of your video marketing strategy. Social platforms like YouTube, Facebook, Twitter, Instagram, Vimeo etc has their own video ad formats and publisher tools which are very helpful and can boost your branded strategic plan. Remember the key elements that are required for the efficient marketing strategy. You must need these 10 things in your video marketing strategy to make it perfect. Scheduling has great impact and it must be there in your marketing strategy. An effective publishing schedule is very important to become successful with a completely balanced distribution strategy. Go for multiple video channels and every channel is very different and has a different audience. So develop a video marketing strategy for multiple channels in order to grab the attention of diversified audience across the multiple video channels across the web. Plan your video length and design basing on your requirements and place this element in your strategy. Live video streaming has become the most important way to reach the audience in real time. So, make this as a live video marketing strategy to bring a high-level interaction with the web audience. Video content quality plays a huge role in your reputation management as well lead management. So maintain good quality video and audio output to reach the targeted demographics across different platforms. Draw the best and creative titles that are relevant and catchy for your viewer. A quality title can means a lot for your video marketing strategy as people like to click on the best and relevant title for their queries on search results. User-generated content always has great potential to reach the huge audience across the web. so, vote for user generated content and it must be in your video content marketing strategy. Your video content marketing strategy must also contain tutorials and how-to videos which can be very helpful to the audience to understand about your company and products. An effective call to actions is the best ways to catch the viewers and to attract them as magnets into your sales magnetic field. So, include a good CTA strategy in your video marketing strategy plan. Video analytics and ways of measuring the performance and the related tools must be there in your strategy before implementation of your strategic plan. Metrics can help you to estimate the future leads and present standards of your efforts with the strategy. So that you can implement your next strategy more effective with good improvements to reach your targeted audience cross the web. ● Implement your content marketing steps one by one by following your schedule. Don’t skip your scheduled process while implementing your video marketing strategy. ● Concentrate on video products marketing by implementation various types of video content in different video formats across multiple platforms. ● Don’t neglect the social media platforms as they can increase your reach and reputation across the web. always do manage your social channels basing on your planning. Never neglect the things in the process as it may break your strategic chain. ● Most of the marketers and individuals are failed to reach people due to the imperfect implementation of the perfect plan. So implementation plays a vital role along with planning. ● Don’t over promote your content in your videos marketing strategy because too much promoting will not work better in the present scenario. Make honest efforts with perfect implementation and reap good benefits of video marketing.